This corded necklace is made using waxed cording along with satinique cording. The length can vary from about 17.5 to 20.5 inches with a center jeweled piece that adds almost 4 inches. It is done in a white and gold. 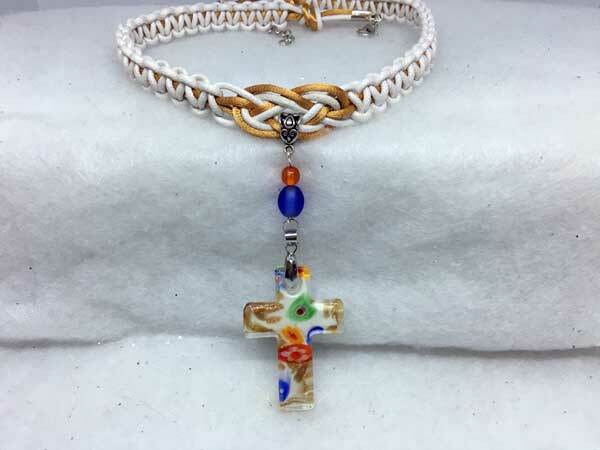 The focal bead is a beautiful lampwork glass cross with a white background and bits of color in gold, blue, orange, green and red. It is hanging from beads in colors I've chosen to accent with a frosted blue glass bead topped by an orange glass round. It is SO lovely in person and will get lots of compliments! The piece is finished with a lobster claw clasp and added chain for more versatility with the length.